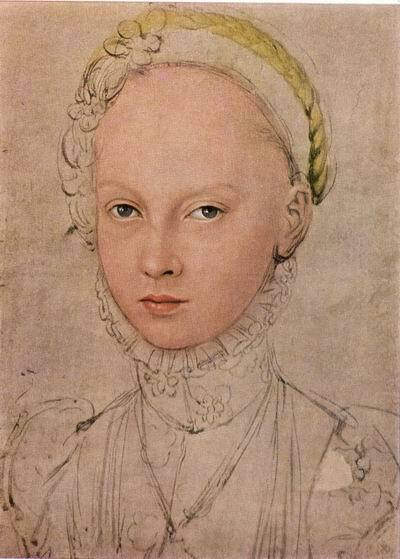 Eleanor of Toledo was born in 1522 as the daughter of Pedro of Toledo, the Spanish Viceroy of the Kingdom of Naples and second cousin to the Emperor Charles V. His brother was the famous Duke of Alba who governed the Austrian Netherlands for the Emperor. In 1538, she married Cosimo I, Duke of Florence. 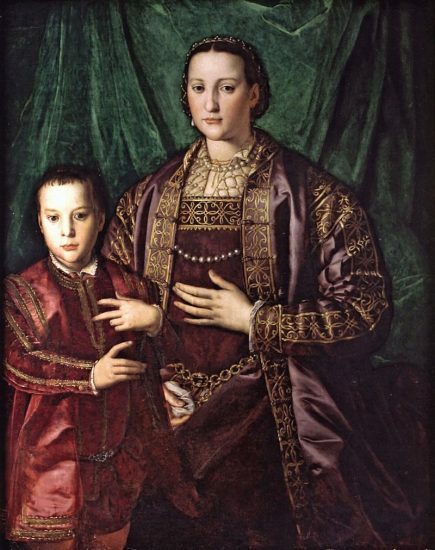 Cosimo had been interested in allying himself with the Emperor to strengthen his rule in Florence and had hoped to marry the Emperor’s illegitimate daughter Margaret. This was denied him, but Charles V proposed the wealthy and beautiful Eleanor as a bride instead. Cosimo had to pay heavily for the privilege, but he was rewarded with the removal of Spanish troops from Florence shortly after his marriage. Eleanor was known to be a gambler and is thought to have also been a difficult taskmaster. Letters that survive show her returning items that did not meet her exact standards for quality or taste. She kept many gold and silver weavers busy creating the elaborate textiles for her wardrobe. But she was also a patron of the arts, a supporter of the Jesuits, a shrewd investor and periodically Regent of Florence. 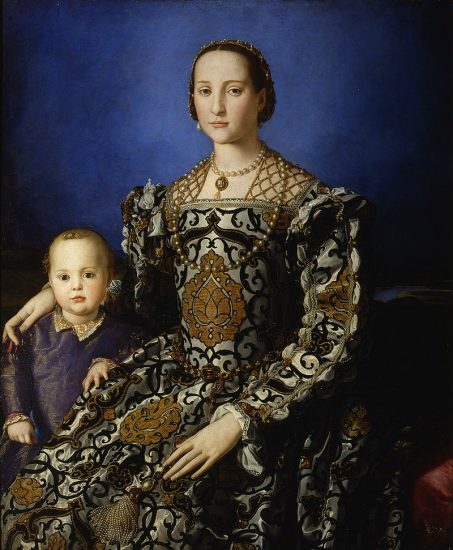 She is best known for the portraits of her by Bronzino, particularly one in which she is shown with her eldest son. It is thought that these were a public relations effort by Cosimo to bolster the stability and legitimacy of his family after years of debauchery by his Medici predecessors. Bronzino also decorated a private chapel for her in the Palazzo Vecchio, which can be visited today. She is also remembered for her renovation of the Pitti Palace which she bought in 1549. Originally Eleanor and Cosimo lived in the Palazzo Vecchio. This was also the administrative seat and housed the militia. She also objected to the noise of the lions that were in an adjacent menagerie. 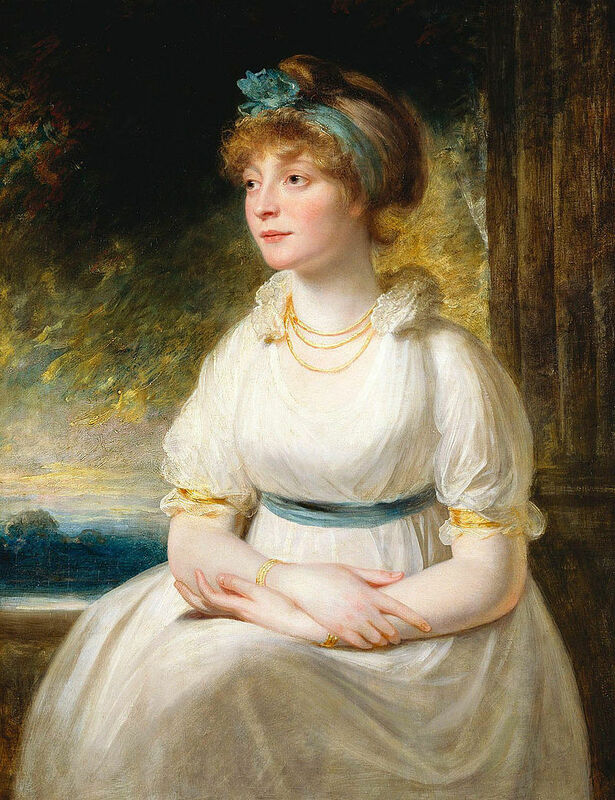 Having grown up in the splendour of the Neapolitan court, she aspired to more. She spent ten years renovating the Pitti Palace and eventually, like many who renovate, she became dismayed by the delays. She set a date for moving, and when the builders did not meet it, the family moved in anyway. The upper floor was for Eleanor and the children, the middle floor for her mother-in-law and the ground floor for Cosimo. They also purchased the land surrounding it for their gardens from a family named Bogoli. The name eventually became corrupted to Boboli, and these are the famous Boboli Gardens. Eleanor was not able to enjoy her new home for long. In 1562, she was suffering from tuberculosis. Despite the doctor’s warnings of malaria in the area, Cosimo requested that she accompany him on a trip to review several fortifications. Three sons joined them as well, and soon two were dead. Eleanor died six days later, weakened from nursing them. She was only 40 years old. For centuries rumours abounded that one had killed the other and that Cosimo had then slain the perpetrator. Recent forensic examinations confirmed that they had, in fact, all died of malaria, just as the family said all along. Cosimo was devastated by his loss and soon turned over much of the rule of Florence to his son. She is a very interesting woman. Ive never seen the second portrait. Is it a Bronzino too? Yes, he painted her several times. 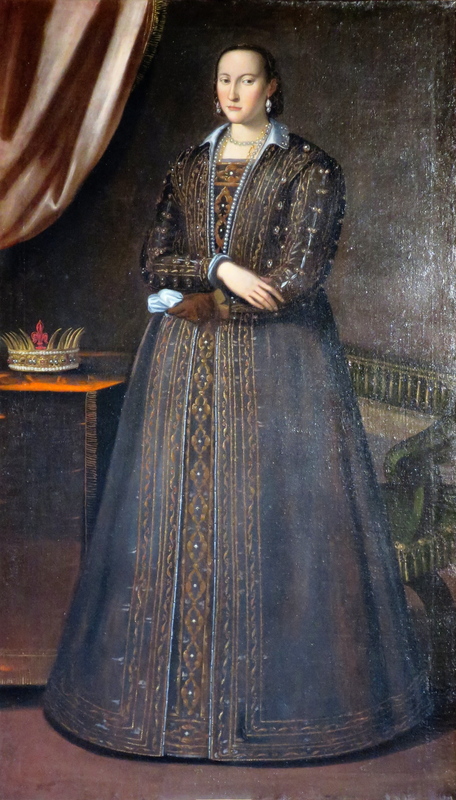 Leonor suffered from bad health (decalcification of teeth and bones from so many pregnancies, and lung problems, probably asthma, since childhood) and this is said to have been the main reason to acquire the Pitti Palace (which btw she bought with her own money, no Cosimo’s). The Palazzo Vecchio was an older building, by the Arno, so it was damp, musty and dusty (dang, still it is so), which worsened her respiratory problems. She may have thought, quite logically, that moving to the oltrarno, further from the river and surrounded by the fresh air of the Boboli hill would help her health. Regarding the “splendour of the Neapolitan court” it wasn’t quite so. When her father arrived as viceroy that city was pretty chaotic, with pirates attacking regularly, etc. There wasn’t much money allocated to live ‘in splendour’ (although Don Pedro managed to acquire with his own money a good collection of art pieces and books during the 30 years he was the viceroy). Leonor was, indeed, daughter to a viceroy, granddaughter to a duke and niece to a king, but she grew up in austerity in a harsh land under the tutelage of a father that was already well known as a great man of arms back then, and that saw her as his own image. She knew the importance of looking rich so her husband would be respected by kings and princes throughout Europe, and also she wanted, and pushed very hard for it, to recover the fabric business that had brought great prosperity to Florence some generations back. She was going to be the ‘runway model’ of the local trade, so she could not accept seconds if they wanted to be the number one exporter of wool and silks. 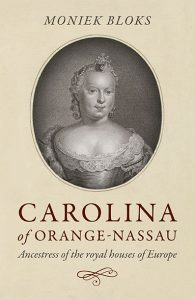 She was Spaniard, and she always spoke Spanish at home with her kids, and she was surrounded by Spaniards, both those who had come to Florence with her and those that were already living in Florence and were wealthy tradespeople when she arrived, and it is said that many florentines resented her for all of this. What was written about her was done by italian ‘historians’, and they portrayed a biased image echoing the ‘black legend’ about Felipe II coined by the British. Thankfully her persona has been studied more objectively by some academics in the last years.